The mitral valve controls blood flow between the chambers on the left side of the heart, which pumps oxygenated blood to the body. There are two main problems that can occur with the mitral valve: it can become too narrow (stenosis), or it can leak (regurgitation). 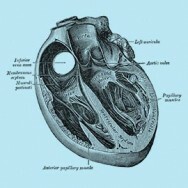 Abnormal blood flow through the valve will then cause the heart to work harder, and eventually lead to heart failure. Symptoms of this include shortness of breath, light-headedness, fatigue, chest pain or palpitations. Usually the sternum (breast bone) is divided to access the heart. Alternatively, minimally-invasive mitral valve surgery can be performed through a 5-10 cm horizontal incision (called minithorocotomy) on the right side of the chest, with 3 keyhole incisions around this for instruments. These incisions are shown in Figure 1. Specialised, long instruments can be used (referred to as “mini-mitral” surgery), or alternatively a surgical robot can be used (referred to as “robotic mitral valve surgery”) that gives the surgeon an excellent 3D view and precise movements. The surgical robot that Sydney Heart & Lung Surgeons use is called the da Vinci Surgical System (Figure 2). Not everybody is suitable for minimally-invasive mitral valve surgery, so you should discuss this with your surgeon. Minimally-invasive mitral valve surgery has similar risks to traditional open-chest mitral valve surgery, including wound infection, bleeding, kidney injury, stroke, heart attack, arrhythmias and pacemaker implantation, and possibly death. With minimally invasive surgery there is also the risk that procedure needs to be converted to the traditional open-chest method. If repair is not possible, then the valve will need to be replaced with an artificial one. This can either be a mechanical valve, or a biological one. Both have advantages and disadvantages that your surgeon will discuss with you. Systematic review of robotic minimally invasive mitral valve surgery. Seco M, Cao C, Modi P, Bannon PG, Wilson MK, Vallely MP, Phan K, Misfeld M, Mohr F, Yan TD. Ann Cardiothorac Surg. 2013 Nov;2(6):704-16. doi: 10.3978/j.issn.2225-319X.2013.10.18. Review. Custodiol for myocardial protection and preservation: a systematic review. Edelman JJ, Seco M, Dunne B, Matzelle SJ, Murphy M, Joshi P, Yan TD, Wilson MK, Bannon PG, Vallely MP, Passage J. Ann Cardiothorac Surg. 2013 Nov;2(6):717-28. doi: 10.3978/j.issn.2225-319X.2013.11.10. Review.